In 2009 I was fortunate to have several images in the BBC Wildlife Photographer of the Year Awards, which earned me the opportunity to fly out to London for the awards party and a nature photography seminar afterwards. Among the many inspiring and fantastic photographers I got to meet was Vincent Munier, a French nature photographer with a passion for photographing wildlife in the dead of winter. After seeing his presentation on photographing Musk Ox and Great Gray Owls I bought his book ‘White Nature’ (signed, of course), and have drawn on his simple yet moving environmental wildlife portraits for a lot of inspiration for my (admittedly few and far between) wildlife images. My trip to Yellowstone was in part inspired by Vincent’s images, hence the title of this post. The day after my parents and I arrived at Old Faithful I started to familiarize myself with the snow blanketed landscape. I started off the day with a 2 mile snowshoe around the boardwalks, followed by a 13 mile cross-country ski tour of various trails, primarily in search of wildlife. It snowed the entire day – those giant fluffy white postcard-style snowflakes. I didn’t see a single living animal, and I didn’t take a single picture. This was not the most promising start for our vacation! 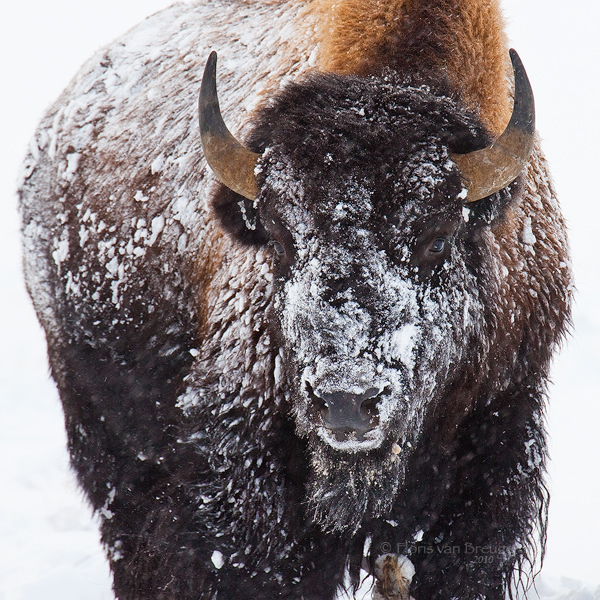 The next day I explored some areas further from the Old Faithful area, and finally found a large group of snowy Bison. Most animals are inherently curious, and they will occasionally look up at you to see what you’re doing with that weird mechanical contraption. I love that connection – looking into the eyes of wild creature, and attempting to understand what it might be “feeling” (as a graduate student in Biology, that word is taboo, but I will use it nonetheless). This, combined with my inability to sit still, is why I have never photographed from a blind, and don’t think I ever will. Note that I said most animals are curious.. well, Bison are not curious. In the winter they are concerned with only one thing: staying alive. This means shoveling aside snow with their muscular heads in search of food, warming up next to the hot springs; they have zero interest in whatever you’re doing. This makes it incredibly difficult to take a portrait where they’re actually looking at you! The majority of the wildlife in Yellowstone lives in the Lamar Valley, which is a short drive from the Mammoth Hot Springs area. The biggest attraction out here is of course the wolves, which were reintroduced in 1995 after being absent from the park for about 50 years. Now there are about 100 wolves roaming the park with an average pack size of about 10, though one pack has over 30 members. Many of the wolves are fitted with radio collars, which allow biologists to keep track of their activities. Your best chance at seeing the wolves in the Lamar Valley is actually to look out for a massive traffic jam of cars, typically surrounding a bright yellow Xterra which belongs to Rick McIntyre, the “wolfman”. He is out there nearly every day with his radio receivers and high power spotting scope looking for the wolves. My parents and I were fortunate to catch a fleeting glimpse of the Druid Pack racing across the frozen landscape from across the valley (they were hardly specs in my binoculars, so no pictures!). As far as photography goes, I had a lot more luck with the Red Foxes. Of all the wildlife images from the trip, “Hunting Trails” (below) is my favorite. 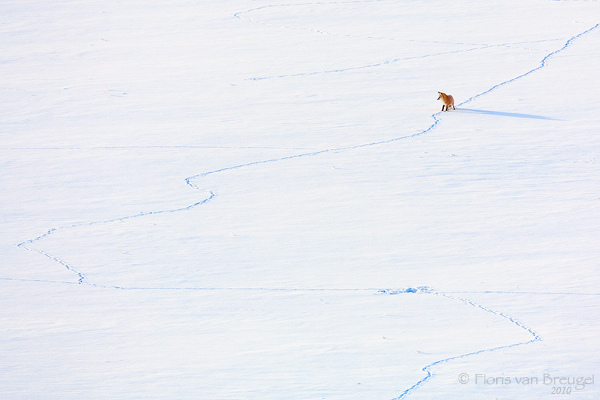 I love the subtle story it tells about the fox, which spent the morning retracing its hunting trails through the deep snow listening for voles, pouncing, and digging. The whole story is left in the snow. On our second morning out we were lucky to find a group of 10 bull Elk – usually they don’t get together in such large groups. The frosty cottonwoods and soft morning light made for a beautiful scene, well worth standing around in the single digit temperatures. 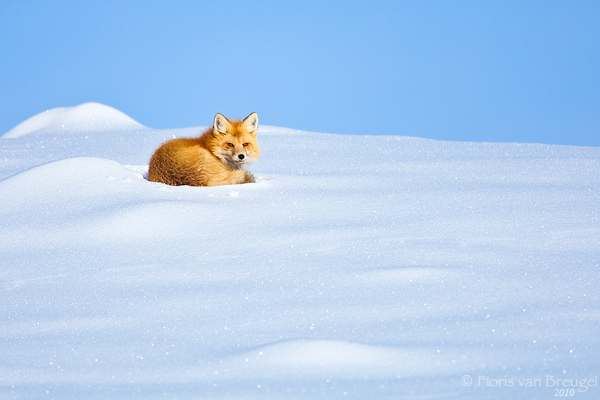 Man I’m jealous over those red fox shots! You couldn’t have asked for better accompanying scenery for the wildlife than the fresh snow. These are amazing, Floris! I especially love the fox images. Thanks! Glad you all enjoyed the foxes so much. Jim – I don’t really have any suggestions.. all of these images were shot with my 500mm, and I don’t have a polarizer for it (nor would I expect it to be all that useful for this kind of stuff). I don’t pay attention to white balance, because I always change it in post processing anyways. 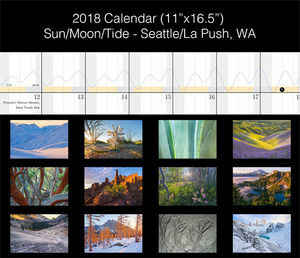 The exposure is pretty easy – just set things up so that you don’t blow out the snow but keep it as far to the right on the histogram as possible, everything else falls into place. Thanks — Yesterday, I was out practicing snow photography by shooting skiers in the mountains of North Carolina. A well-meaning individual approached me and offered plenty of “free” advice on his snow shooting techniques. Since many seemed rather unconventional, I just wanted confirmation from you; where magnificent images speak louder than words! Incredible pictures and lovely writing! 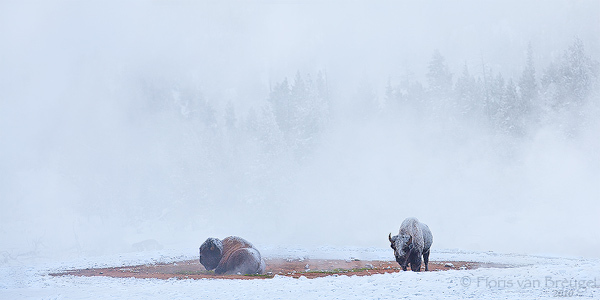 My family plans to spend the holidays in Yellowstone in 2013…any advice on locations and activities to catch a glimpse of the wildlife? Were you skiing or on a guided tour when you found these? Any advice is appreciated. Thanks again for sharing! Thanks Gab! 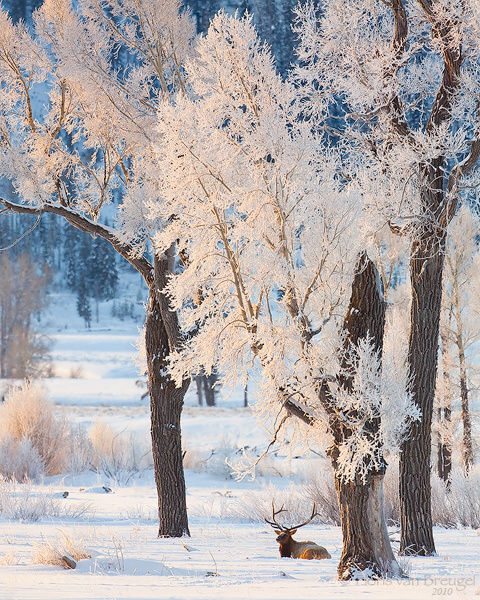 The majority of the wildlife is best viewed in the lamar valley. Stay in the Mammoth area and either have your own (or a rental) car, or go on a wildlife tour. When I was there we did the ‘sunrise’ wildlife tour offered through the park service on two mornings. Unfortunately you really need to be driving to see the wildlife, otherwise you won’t be able to cover enough ground. Bison and Elk you’ll see just about anywhere in the park – the Old Faithful area is definitely worth a few nights in the winter!